Today we're hearing from Zach Mory, an Illinois-based artist who won an Artist Seed Grant to bring "Untitled," to ArtPrize Nine. Read on to learn more about this project, what inspires him, and more. 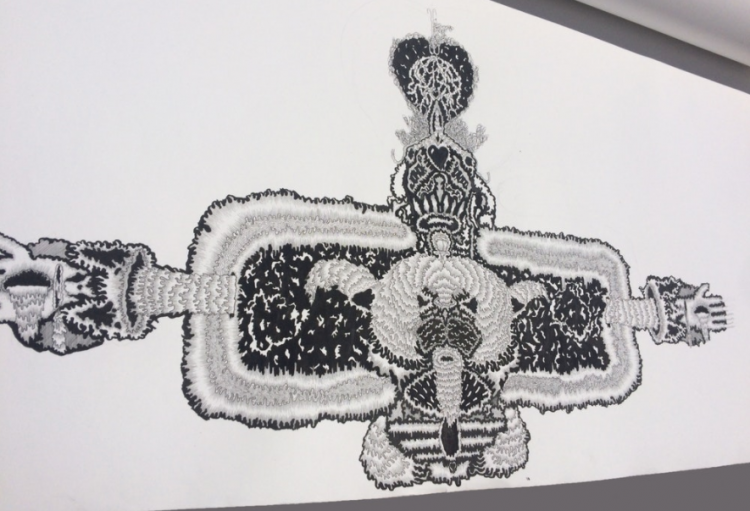 I’m making a relatively large-scale drawing in ink on paper. It consists of fine mark-making and subtle motifs. It's symmetrical compositionally and expands upward. It's an unconscious expression as my work seems to be going in that direction. Last summer I did a series of masks on paper with ink called "Wastoid Void," which used this shaky abstraction, fine mark-making and subtle symbolism as the driving force behind it. This piece comes directly from that. I like to work illustratively, so this piece seems to be pushing that mindset even further towards abstraction. Karl Wirsum’s "Click" is right up there as a favorite work. I love the color, the line quality, the symmetry and the push towards abstraction that the piece displays. Karl Wirsum’s work as well as that of all of the Chicago Imagists including Gladys Nilsson, Roger Brown, Jim Nutt, Sueleen Rocca, Art Green and Ray Yoshida, inspire me. Music is a driving force in my life. I love rock and roll as well as more experimental music. Lately I’ve been listening to Bing & Ruth, Oneohtrix Point Never, Sote, Steve Hauschildt, Girlpool, Ty Segall and Jeff Rosenstock. My dream project would be to make a large-scale mural. I love creating more illustrative paintings in black and white and would appreciate the opportunity to create a large-scale mural…maybe at ArtPrize next year? Who knows. It would undoubtedly be a dream come true.